WBO and WBA champions Trson Fury will be defending his heavyweight titles against Wladimir Klitschko in the rematch set to take place on Saturday, 09 July 2016 at the Manchester Arena. It is one of the highly anticipated boxing fight of the year and Klitschko will be looking to revenge his defeat last november when Tyson Fury won a points. Fight will be televised live in the UK on BoxNation and below are all the details of the big night. After long hard negotiations both parties finally agreed for the rematch which will take place in 20,000-capacity Arena in Manchester. 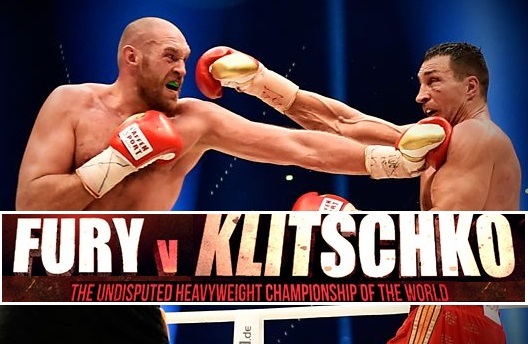 BoxNation pulled of a surprise when they outbid SkySports to get the Klitschko-Fury II tv rights in the UK and they will be broadcasting on their regular subscription channels which cost around £12 a month with no contract required. As far as USA is concerned, HBO has the live rights for the fight for US viewers and they will be broadcasting on regular channels (non-ppv). What TV Channels Will Broadcast Klitschko vs Fury Live ? Other worldwide coverage ? We will update the post with more channels showing the fight in different parts of the world closer to the fight. How To Watch The Fight Live Online Free ? As always there will be plenty of ways to tune in to the live coverage of the fight for free online as many dedicated sports streaming sites will be posting live links of the event. totalSPORTEK will get the best streams and post 2 hours ahead of the start undercard fights. So check back 1 week before the fight to see details of Klitschko vs Fury Live Streaming at totalSPORTEK. It is definitely going to be one of the most exciting match. I am eagerly waiting for it to happen. hey buddy can u tell how in india i can watch this fight live; which website will broadcast it live?? hey buddy can u plz tell me hw can i watch this fight in india online?? Does anybody know about which channel to watch this fight on TV in Indonesia? ?